The boy carried the cash into Dunkin' Donuts after selling a gaming computer, police say. Police allege the 16-year-old who was robbed at gunpoint in Saco in September was set up by a co-worker who arranged to have the teenager robbed as he took out the trash at their workplace. The 16-year-old was robbed at gunpoint of $1,400 at about 5:40 p.m. on Sept. 10 outside the Dunkin’ Donuts on Main Street, where the victim worked. 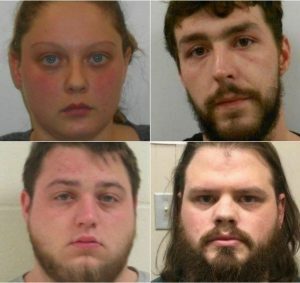 Four people are charged with one count each of felony robbery in the alleged scheme. Eric Soletto, 25, of Biddeford is being held in lieu of $5,000 cash bail at the York County Jail; Taylor Mann, 22, of Biddeford, who was released on $10,000 bail; Brian Patch, 24, of Dayton, who was released on $10,000 bail; and Kayla Haley, 21, of Old Orchard Beach, who was released on $5,000 bail. A few days before the robbery, the victim had sold a gaming computer to a friend for $1,400 cash, according to a police report filed in York County Superior Court. Police said the victim carried the cash around with him after he made the sale and showed it to at least two co-workers, including Mann, on Sept. 9. Mann told the victim that he should put the cash in the bank, police said. The next day, the victim still had the money in his pocket when he went straight from school to his job, where Mann also was working that day. Mann’s friend, Patch, showed up at the Dunkin’ Donuts around 5:20 p.m., according to a police time line established with surveillance footage. Mann and Patch went outside and smoked a cigarette near Patch’s car, a black and white 2008 Ford Crown Victoria that used to be a police car. They came back into the store at 5:31 p.m., and Patch immediately began speaking to the victim at the counter. Exactly 30 seconds later, a man on foot – who police later identified as Soletto – approached the Dunkin’ Donuts parking lot and entered through the main door, looked around inside and left the area headed toward a lower parking area. Mann then told the victim to take out the trash. As the victim was leaving, Mann opened his cellphone and texted someone, police said. When the victim got to the dumpster behind the business, police say Soletto approached him brandished a Glock-style handgun, cocked the granite-colored slide and pointed it at the victim’s head. “Give me what you have,” Soletto told the victim, police said. The victim, with his hands in the air, told Soletto there was money in the store. “No, what you have on you,” Soletto said, as he pointed the gun at the victim’s right front pocket. The victim turned over the cash. He later told police it was the scariest experience of his life. When the victim returned inside to the store and reported that he had been robbed, Patch offered to go out searching for the robber. Mann was the first to be arrested on Oct. 30, and after he was read his Miranda rights, he agreed to answer police questions. Mann told investigators that on the morning of the robbery, Mann told Patch that his coworker was walking around with a lot of cash. Patch grew angry, and said Mann should have called him the night before so they could rob him; Patch said if the victim returned to work carrying the cash that evening, they would “get him” and that he was a “stupid kid” for carrying around that much money. So when Patch and Mann met outside the Dunkin’ Donuts and smoked a cigarette, they discussed how Mann should direct the victim to take out the trash, at which point a friend of Patch’s would rob him. The friend, Soletto, already had been dropped off nearby. Patch was arrested on Nov. 1, and after he was read his Miranda rights, he also agreed to talk, and confirmed Mann’s version of events: Patch and Soletto conspired to rob the victim, and Patch agreed to pick up Soletto on Stockman Avenue, a side street less than 500 feet from the Dunkin’ Donuts. Using surveillance footage from multiple businesses around Dunkin Donuts, police confirmed that after the robbery, Patch’s black and white Ford turned onto Stockman Avenue. Patch told police that after the robbery, he dropped off Soletto in Old Orchard Beach. The fourth person charged with the robbery, Haley, was not mentioned in the police report filed in Soletto’s case. Haley’s residence was listed as Old Orchard Beach. Police declined to answer questions about the case, and said it was still under investigation, and because Haley and the three others were bailed from jail, no documents have yet been filed in court. Mann, when reached by phone Wednesday, confirmed that he knew Patch – they went to the same group home, he said. But when he was asked by a reporter about why he was charged, Mann hung up the phone. He is due back in court Jan. 17. Patch’s next court date is Feb. 7. Haley’s date in court has not been set. Because the charge against all four is a felony, they will each face possible indictment by a grand jury, which convenes monthly.